SBI Rss Tutorial for Easy blogs, blog launch platform. Learn how to put a dedicated news blog on your SBI website. 230 page masters course. Put a content rich blog launch platform on your website and watch your search engine rankings soar. SBI Rss Tutorial is the complete package to put a blog launch platform on your websites, using Easy Blogs software. Welcome: It is my pleasure to introduce you to SBI-Rss-Tutorials. Masters blogging course for Easy Blogs software, for any website especially Site Build It websites. Great News for Website Business Owners Who Want To Make More Money. "Now You Can Ramp Up Your Search Engine Positioning And Double Even Triple Your Traffic By Adding A Blog Launch Platform To Your website!" How to get your Blog rolling, including customized templates that are guaranteed to work with your SBI website. Where to put your keyword and description tags - and where not to! How to make your blog pages match your SBI template (or, if you choose to, give it a whole new look). The precise tool for HTML Uploaders to use to create a blog template matching their website design. How categories in your blog increases the volume of your website by 30% or more! Learn how inside SBI Rss Tutorial. Secret tips to get your blog loaded onto your Site Build It site in record time! Exactly WHY you might want more than one blog on your website. Where to get free content to put in your blog entries. The right amount of content to add on a regular basis so that the search engines see the new content and keep crawling back to your website! Exactly what tools you need to use to generate the interlinking pages of your blog. Where to go on the web to list your blog for syndication and some extra special secret insider information on how one particular submission will get your blog noticed fast! Why you must never tell the whole story in your blog entries. This is one time when being a tease will get you more interested visitors. How on-site blogs breathes new life into your website and can help boost sales. How to announce your RSS Feed and blog to the world using our free RSS submission software! (Rss Announcer) Comes with SBI Rss Tutorial. You are about to experience an adventure! Building and publishing your own blog the way you want it, and having all the advantages of it being right, is exciting. SBI Rss Tutorial package will teach you how to put a blog launch platform on your site, update it on a regular basis and create the all important XML file that will publish your blog across the web. Create and upload your own Blog Launch Platform to your website. Generate an XML feed document that will be picked up by blog aggregators, readers and websites looking for your content to post on their sites! Populate your blog with the right amount of content to feed the search engine spiders and keep them coming back every time you post a new bit of information. Ping your Blog to update centers on the web. List your blogs in RSS and Blog directories for others to pick up and distribute your Dedicated News blog. Your blog pages match your SBI template(if you want to but there are so many choices of templates, you may just go wild with a new look. Control meta tags, keywords and descriptions on your blog for consistent search engine optimization. Easily Add Google AdSense to your blog pages. Templates show you right where to put your ads and widgets. Provide the capability for your visitors to leave comments! Intergrate SBI 2.0 and Content 2.0 pages. Categorize your invitations keep and keep them organized automatically. And, yes, folks...even how to get your blogs indexed by Google within 10 days or less just like we did! Details included in the tutorials. With Easy Blogs You Can Work anywhere! You are not tied to the internet to manage your blogs. Create entries, articles or do your content management right on your computer from anywhere in the world. Ideal for those that upload your own HTML. No need to use online time to build your posts, excellent for dial-up users. No sub-domain needed to incorporate into your website. Quick easy to load and publishing techniques frees you up. Create multiple blogsnot just one all controlled from one place. Works with any website not just Site Build It websites. Easy to use html editor creates archives, articles, blog entries, static pages and categories. Can be used as a website builder. Auto-discovery code informs RSS feed services of each entry. Why should I use Easy Blogs instead of Blogger or WordPress? Let me count the ways EB will blow them all out of the water. Match the look and feel of your SBI website. Select your template or customize one of your own (template library comes with SBI Rss Tutorial). Easy Blogs content management system completely organizes your files automatically. Interlinking and menu navigation is done for you. Creates 100 separate blogs, no additional hosting or fees. No additional fees, one time download. EB creates html pages that you simply load up to your website. No monthly fees, no additional charges ever. Html and template modifications right in the included editor.EB allows complete control over what goes on your website / blog. No unwanted or outside advertising can make it on to your website without you putting it there. No little logos that say "Powered by: Someone else"
Create and add extra pages to your blog. Select from 5 different page types.Complete instructions inside SBI Rss Tutorial. Tracking statistics from SBI show you how well your pages are doing.All the advantages of SBI tools apply. Back up files tool allows you to protect your blog from loss. Add Content 2.0 (C2) pages to your blog. Incorporate the power of SBI 2.0 into your blog. No other blogging platform allows that. 229 pages with illustrations and directions to create up to 200 blog/websitess. All inclusive instructions on how to build, market and publish your own Blog Launch Platform. Get started today. Easy Blog Templates for SBI included in the package. Download as many templates as you want with purchase of SBI Rss Tutorial. Templates supplied with tutorial. Here are a few samples. Create your own template or customize and existing template from our extensive library. Templates come with the tutorial. 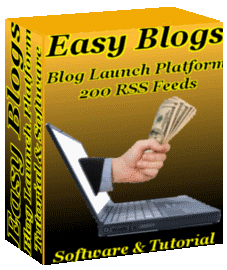 Easy Blogs, blog launch software included with the SBI Rss Tutorial. Value $45.00 Yours free. 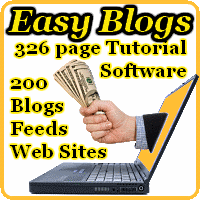 Easy Blogs allows anyone to write and publish his or her very own web log or "blog". Simple enough for the non-technical, and yet with enough extra features to please the demanding too. Use one of the many included website templates or build your own. Templates are designed to be sharable with other Easy Blogs users. Store your Blog on your PC. Publish anywhere! So what's included in the SBI Rss Tutorial? SBI Rss Tutorial - Blogging Masters e-Course, 229 pages of instructions, illustrations and examples. 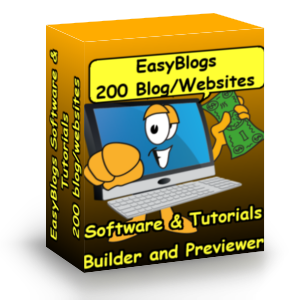 Easy Blogs software - blog launch platform. Creates up to 200 separate blog/websites. Template library - easily match the look and feel of your website. Or customize your own. Inquire about custom design service. How to articles - Quick reference articles for the technical side of Easy Blogs. 30 day full support. Then free advice from then on. In depth articles on how to modify the template yourself. Updates and new tutorials are added to SBI Rss Articles and cover the most common modifications in detail. I use Easy Blogs to create an article section on my SBI website, which provides my visitors with new information and also articles they can use on their blog or website. When I transitioned my site from a blockbuilder design to a new HTML template, I had no idea how to transition my Easy Blogs template and the hundreds of Easy Blogs pages I had on my site with the old design. It was an overwhelming prospect! I consider myself extremely lucky to have found Tim Koen who not only knew how to help me, but did a fantastic, prompt and very professional job of creating a new Easy Blogs template for my site. He figured out all kinds of details that would have taken me years to learn, he answered my many questions promptly and thoroughly, and he did an absolutely perfect job so that my Easy Blogs pages exactly match my site template. I'm thrilled with the results! Now I can upload a new article in just two minutes, and the new articles on my site match the rest of the design, and display in their own unique RSS feed for my visitors. I highly recommend Tim's work! I just wanted to send you a note to thank you for your help in getting my blog all straightened out. You are whiz at the Easyblogs/SBI combo. There is simply nobody else that I have encountered that seems to be able to assist so fully. Although I only had one small issue when I called on you for help, it soon became obvious that there were some major problems with my blog that I would never have discovered if you had not been so thorough. Not only did you fix the original problem, but you helped me practically rebuild the blog by setting up HTML code that I simply would never have been able to do myself since I am not versed in that aspect of things. I know you added some other important goodies that I don't understand but that I know will help me to draw more traffic (and more dollars) to my site. Finally, I appreciated that you spent so much time with me, helping me to understand the full potential of my blog. You certainly went above and beyond the call of duty. I was very surprised at the low cost of your services, and would not have blinked an eye if it had cost me double that! Thanks, Tim, so much for your excellent service. Q: How Much is this tutorial package worth? A: One heck of a lot more than the asking price. Imagine having the ability to create dozens of blogs. Coupled with step-by-step instructions on how to dominate the search engines and you've got a fantastic deal. Future updates will be free to those that act now. When I come to my senses the price will go up to $49.95. Full 30 day guarantee. No questions asked. If you are unsatisfied in any way we will be glad to send you a refund. 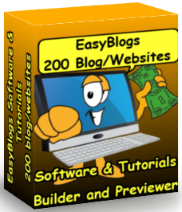 Easy Blogs Software and Tutorial are all I use to build my websites. EB can use any template, any DOCTYPE and any platform that you can upload to. Highly recommended by BWT. Customer Service - No matter what time of day I'm here for you. Unlike other design firms I work all the time, days, nights, weekends and holidays. I'm just a phone call or email away. Get free advice for 30 days forever. If you need me to communicate with your designer in the very early morning, it will be taken care of. Relieving you of as much stress as possible is my goal - and I always achieve it! Please do not hesitate to ask if you have any questions about SBI Rss Tutorial or Easy Blogs.